Unspoiled landscapes, magnificent medieval towns set in midst of sparsely populated countryside, villages where the age-old rhythms of life still continue, country roads where farm animals and horsedrawn carts are still a common sight, and motor cars few and far between, hospitable and friendly local people, and excellent value for money - no wonder Eastern Europe is so attractive to cycle tourists! This is true of Southern Poland, but it could be a description of many other East European holiday areas - from Estonia to Slovenia. What is it that makes Southern Poland different? Why is this region, once part of the "Kingdom of Galicia", worth exploring on two wheels? Here are a few reasons . . .
Krakow: One of the most beautiful cities of Eastern Europe, Krakow was once Poland's capital and is now the country's biggest visitor attraction - but most Westerners have yet to discover Krakow and its many delights. With an ancient university, the city has a large student population and exciting cultural life. The medieval town centre, with its many bars in the streets around the main square, is still very much alive. All the main historic sights are so close together that it takes only a few minutes to get from one to another - by bike, of course! Old-fashioned, elegant town bicycles are the vehicles of choice for Krakow's bohemians. The many ecological organisations based here do much to foster environment-friendly transport in the city. Rural Galicia: Poland is the only former Eastern-Bloc country to have been spared collectivisation with the result that the rich patchwork of fields, orchards, woods, meadows and fallow land, once found all over Europe, has been preserved here. The best place to admire the beauty of the landscape created by this traditional strip farming is here in the foothills of the Carpathians. Stretching behind the farmsteads into the hills are long fields, some only a few yards wide, separated by narrow bands of no-man's-land, which are marked out with little stakes at harvest time. 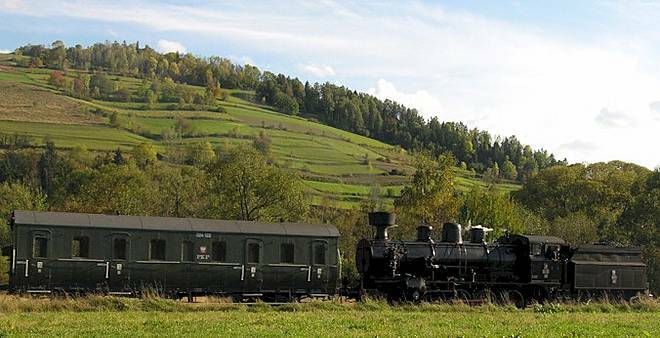 "That day we continued our journey eastwards along the northern slopes of the Beskids. What was striking about the countryside was its naturalness, the lack of people. Characteristic wooden churches stood by the side of the road. Linear villages strung out along the road with a strongly agricultural character were predominant. We cycled through an impressive, open landscape of forests and meadows." 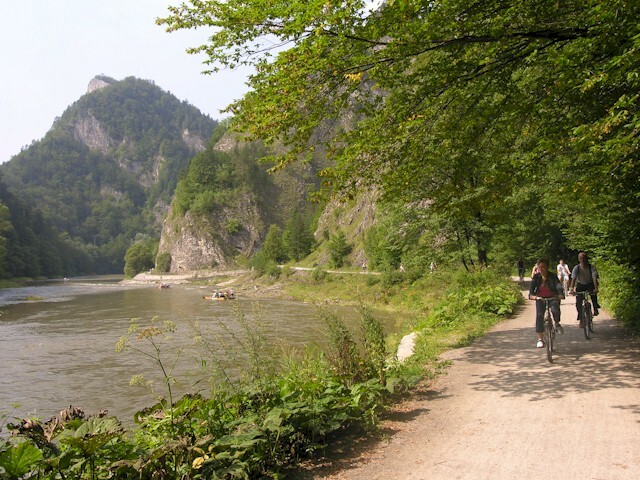 Cycle route through the Dunajec Gorge:This is simply a must. Three cyclists who followed this route in 2001 wrote of the experience: "While the raft trip through the Dunajec Gorge is a favourite with tourists, the route through the gorge is also a real treat for us cyclists, since from Cerveny Klastor (Red Monastery) there is a spectacularly beautiful cycle path running alongside the river Dunajec. The monastery was founded by German Carthusian monks in the fourteenth century who also made the riverside path which we used." The cliff walls of the gorge, in places only about 100 metres apart, rise to a height of 300 metres. It is amazing that such a unique place is so little known! The Dunajec here marks the border between Poland and Slovakia, and for part of the way the cycle path runs on the Slovakian side. In the new, united Europe this is no longer a problem, but for decades it was simply impossible to cycle along the river, until new border crossings for walkers and cyclists were opened in 1990. At first only Slovaks and Poles were permitted to use these crossing, but a few years ago they were also opened to EU citizens. 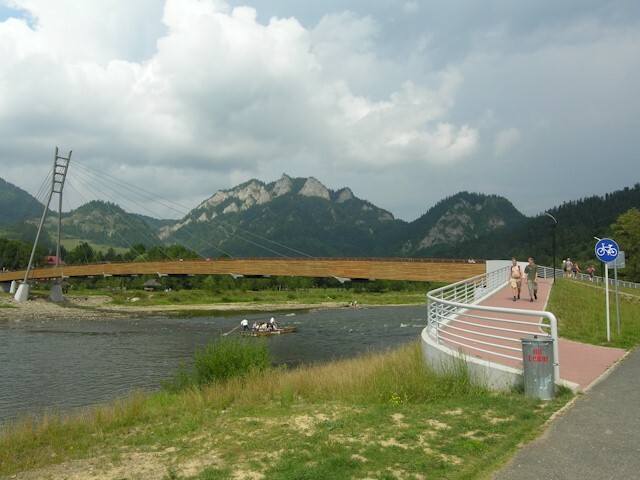 Moreover, on 2006 a suspended wooden bridge for cyclists and pedestrians was constructed above the river, joining Poland in Slovakia.